Rating: Loved, like I could elope with it loved! Did I finish? : Yes, in a few nights. One-sentence summary: A memoirist recounts her mother's life, from her Scottish roots to her childhood in '50s and '60s British-held Kenya and finally, her life in war-torn Rhodesia/Zimbabwe. Do I like the cover? : I adore the cover. It's a picture of the author's mother with her childhood best friend, a chimp named Stephen Foster. It says everything about this book. First line: Our Mum -- or Nicola Fuller of Central Africa, as she has on occasion preferred to introduce herself -- has wanted a writer in the family as long as either of us can remember, not only because she loves books and has therefore always wanted to appear in them (the way she likes large, expensive hats, and likes to appear in them) but also because she has always wanted to live a fabulously romantic life for which she needed a reasonably pliable witness as scribe. Did... I love this book so much that I went out and got Fuller's first book before finishing this one? : YES! I love Fuller's warm sense of humor and wry perception -- she's another memoirist I wouldn't mind having as a friend! Is... the title amazing? : YES. A real tree on her parents' farm, the Tree of Forgetfulness is where locals resolve conflicts, grievances, and problems. The author's parents have their drinks under the tree nightly, and reflect on their day. Am... I glad I read this first rather than Don't Let's Go to the Dogs Tonight, which is the memoir of her childhood? : YES -- only because I felt deeply sympathetic toward Nicola Fuller, Alexandra's mother, in this book (but I'm sort of judging her a little as I read Alexandra's memoir). Buy, Borrow, or Avoid? : Borrow for sure, buy if you can -- an engrossing, compelling read! Why did I get this book? : I grew up on Out of Africa (the movie and the book) and love all things Kenyan, so it was a no brainer for me! Review: I'm having such a difficult time writing this review even though I loved this book (or maybe as a result of loving it!). As a memoir/biography, it had my favorite elements: compelling individuals, a wry writing style, and a tumultuous setting in a location and era I enjoy. I found myself describing this to friends as a kind of apology to Fuller's mother, Nicola, for Don't Let's Go to the Dogs Tonight, Fuller's memoir of growing up in Rhodesia during the violent conflicts there. What I've read so far of Don't Let's Go to the Dogs Tonight so far is honest (brutally, amusingly, depressingly) and unflinching, and Fuller's mother isn't the most sympathetic. 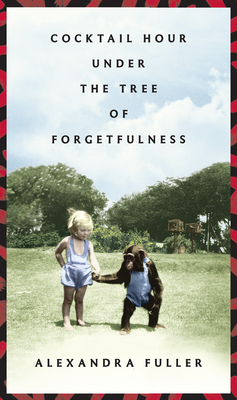 In this book, Fuller goes back to look at Nicola's childhood, her parents, her experience in Africa, her love for the land, and the impact of the violent losses in Nicola's life. What I so appreciated about Fuller's writing was her balance of affection for her parents and an awareness of the implications of their choices. She's no colonial apologist or 'when we' romanticizing the era of British control in Africa. She writes about the violence of late 20th-century Kenya and Zimbabwe succinctly and in a way that felt fair and accurate, that acknowledged the pain and losses on both sides of the conflicts. You definitely make this sound great! I had someone recommend to me Don't Let's Go to the Dog's Tonight recently. I'll keep in mind what you said about reading this first! @Jenny: I'm sure reading Don't Let's Go to the Dogs Tonight would make the people v familiar but I was surprised to find that I felt a little less sympathetic toward Fuller's mother while reading it than when I read this one -- reading the details of Fuller's violent childhood makes me wonder what her parents were thinking, remaining in Rhodesia. In this book, Fuller acknowledges that and honors the decision her parents made. It's so v well done. I love the title and the cover, so it's great to hear that the content lives up to the promise! @Rhapsody: I adore both too - they fit so well with the feel of the story! Lol, I actually do not like the cover at all. I think this one sounds excellent, and like something that I would like to read, but I have to admit that after reading a few other reviews and hearing about some of the ways that Alexandria's mother behaved, I am sort of nonplussed by her. But I do love that the author doesn't villianize her mother either. A very interesting prospect, this book. Wonderful review! Not huge fan of the cover but I love the title! Sounds fascinating and different from what I normally read. 1. I adore your reviews. 2. I love that quote that you used in your review, particularly the part about the hats. From that short quote, I think I'd love the book, and I'm not usually drawn to memoirs. @Blodeuedd: I'm not wild about memoirs as a rule but this one resonated especially because Fuller's writing style is so engaging. But it's not for everyone! @Heather: The mom is quite a character, and thankfully more than once Fuller muses on what her parents must have been thinking and acknowledging that their choices were made in a vacuum, in response to what was going on in their community, etc. I really liked that she had an honest gaze at her mother and she wrote with affection -- and without glossing over. I'd love to see what you thought of this if you ever do pick it up! @Jo: I'm looking for her second book right now, even though it is not a memoir, I'm hooked on her writing. @Elysium: The title is awesome, isn't it? @Trish: Eee, you made my day! The writing in this book was really such a treat, and it elevated this dramatic story without sensationalizing it. It's a quick read, too, easily done in a few days -- I highly recommend it. The section about Nicola's friendship with the chimp was laugh-out-loud hilarious -- what a character! Love the title but the cover turns me off even though I normally love quirky covers. BUT, you made it sound so wonderful. I have to give it a second look. oh loved, don't let's. and sounds like i must read this one as i am interested in alexandra's mum. thanks for pointing out the pics. love the reeeeally old ones, especially the one of muncle. @Vee: And Muncle is a very mysterious and romantic figure in the story -- a great uncle? Grand uncle? I forget exactly but it was a delight to see a picture of him. I CANNOT wait to read this book - I read the author's first book and really liked it. It will be interesting to try to understand her Mom a bit better. "I am wholly an Alexandra Fuller fangirl" - me too me too!!! I'm so glad you loved this one and I'm sure you'll love the previous book when you finish it. Thanks for being a part of the tour! Audra, I think the cover is precious and it sounds like a book I would love. Glad to read your high praise. I read this book a while ago and loved it. Great setting too. THANKS for sharing. Going to check out the photo album. Stopping by from Carole's Your Favorite Travel Books. I am in the list as numbers 11, 12, 13, and 14.